The range of choices in ranches out there is awesome—and for anyone planning a dude ranch vacation, it can be intimidating. There are some similarities: most ranches offer American Plan, with meals, lodging, and activities included, but some do offer Modified American Plan and European Plans. But one thing’s for sure: every ranch serves up a slightly different menu of features to cater to your special interests. To get started, head for Ranchweb.com, where you can find ranches listed by category. Then ask yourself some key questions. Are you interested in a child-oriented ranch or one where child care is provided? How important is the kind of riding program available (and how much of your visit do you want to spend in the saddle)? If fishing, nature walking, or hunting is important to family members, you’ll want to scope out the ranch’s level of offerings in those activities. Food and drink is always key, so don’t be afraid to ask about menus and liquor policies. And if there’s a spouse in the house who just can’t unplug from the Internet or cell phone, you’ll want to check out the ranch connections (they’re not all as remote as you think). Whatever you want, there’s sure to be a dude ranch perfect for your needs, and it’s just a click away! Alan Shore and Denny Crane on horseback? Yep, the wise-cracking, business-suited boys from ABC’s Boston Legal are heading for a dude ranch on next week’s episode of the hit prime-time show. Frankly, we can’t wait to watch them saddle up. We don’t know if actors James Spader (Shore) or William Shatner (Crane) have ever been to a dude ranch in real life, but Shatner is, in fact, a fine horseman. He rides and breeds American Quarter Horses and owns the world champion Sultan’s Great Day. The actor devotes time to AHEAD with Horses, a charity group which gives physically and mentally challenged children the thrill of riding a horse (while boosting their confidence); Shatner is also the annual host for the Hollywood Charity Horse Show. That merits a tip of the hat. Your kid’s first time on the ranch? 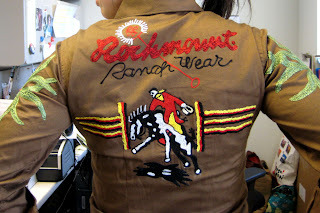 What happens when a city kid makes his or her first visit to a dude ranch? One thing is for sure: they never forget it. I vividly remember my first time on a ranch: I spent so much time in the saddle that I wound up “wearing” a pillow for the next few days. But I formed a love affair with horses that lasts to this day. Tell us about your child’s first visit and how it affected him/her. Did they bond eternally with their pony? 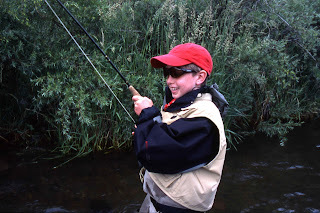 Did your child try his hand at a little fly fishing with a ranch guide (and now wants his own waders)? Perhaps your child may have learned something about nature and formed a love for the outdoors after spending time on the ranch. Or maybe their visit provided a chance to put down the Gameboy and have some quality time with Mom and Pop. If there’s a funny or warm story about your child’s first time on the ranch, please tell us! Post your comments below, or send us an email; we’ll share the stories with our readers.